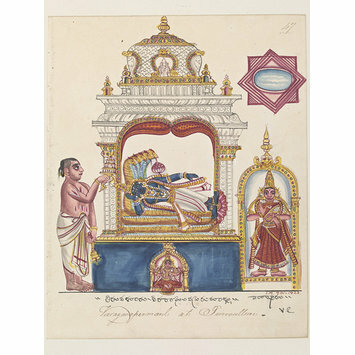 The shrine of Vishnu in the form of Viraraghavaswami, reclining on the serpent of eternity. 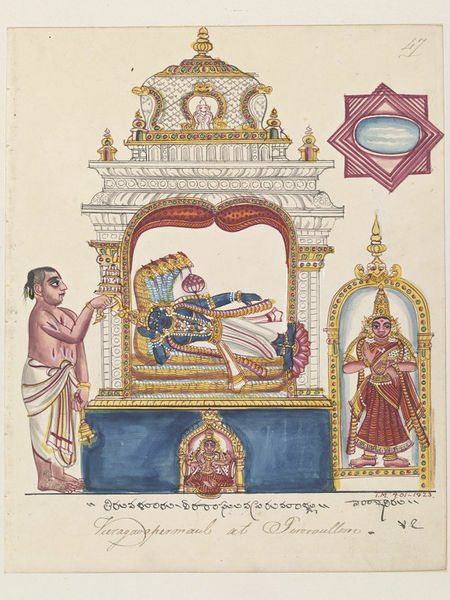 The shrine of Vishnu in the form of Viraraghavaswami, reclining on the serpent of eternity, the form in which he is worhipped at the shrine of Tiravallur in Chingleput district. To the right stands Lakshmi and to the left a Vaishnava priest. Purchased from Mr A. Churchill, 1923. Painting; gouache on watermarked paper, The ^shrine of Vishnu in the form of Viraraghavaswami, reclining on the serpent of eternity, Trichinopoly, ca. 1825.